By William Mackay: Unbeaten British super middleweight champion James DeGale (10-0, 8 KO’s) wants to get his fight with George Groves (12-0, 10 KO’s) out of the way and then move on to bigger and better things. This is a fight that has kind of been pushed on DeGale by the British boxing public. He has little choice but to beat Groves before moving on to the world level. The worse thing that could happen to DeGale is if he struggles with Groves and his win is less than conclusive. If Groves is able to muddy the water by spoiling with wrestling or other such smother activities, this fight could end up being an ugly affair with DeGale winning but not shining and unable to prove that he’s much better than Groves. This would then allow Groves to claim he was robbed and begin campaigning for a needless rematch. DeGale can’t afford to be stuck in the past fighting domestic level fighters like Groves over and over again. Groves is one of those guys that plants himself on you and you need to pry him off of you. The good thing that DeGale has going for him in this fight is his ability to move, throw combinations and fight going backwards. 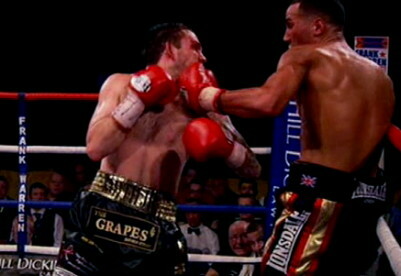 It also helps that DeGale can fight good with his back against the ropes and in close. This will help him if Groves shoves him to the ropes and tries to keep him trapped there. DeGale can then light up Groves at close range just as DeGale did with Paul Smith.